How does a middle-class Afrikaans boytjie from Springs, a rebellious product of Christelik-nasionale Opvoeding, end up in the grubby world of protest punk, slap-bang in the middle of the anti-apartheid struggle? The '80s in South Africa were a mess, a schmangled clusterf*ck of a decade. For some, it was braaivleis, rugby, sunny skies and Chevrolet. For others, it was a one-eyed bumbling about in a world without signage, desperately looking for the emergency exit. While the black population was becoming increasingly agitated and militant, the white dorps, towns and leafy suburbs of South Africa’s cities were mostly ignorant in their privileged bliss. Whiteys were like the frog in the cooker, not realising that the temperature was on the rise. Soon they would slowly, to their terminal surprise, turn white belly-up amid the froth of bubbles boiling from below. Soon it would be too late to get the hell out. But in tiny pockets of white rebellion, the country was beginning to hum with resistant energy in Joburg, Cape Town and Durban. The '80s counter-culture and the music it produced was anti-establishment, anti-government, anti-apartheid, but not self-consciously so. While the state saw this strange white subculture as a hive of hedonists and drugged-up nihilists, this anarchic clutter of guitar-wielding, pill-munching, dope-smoking musicians and their followers were in fact a second front in the struggle against apartheid. 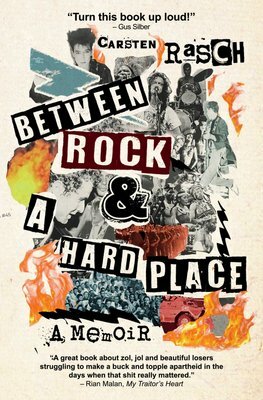 In brilliantly tragic and hilarious detail, Between Rock & A Hard Place is the epic memoir of Carsten Rasch’s role in the South African counter-culture Punk and New Wave scene in the late '70s and early '80s. Through his eyes as a musician, promoter and enthusiastic participant, it tells the story of those tumultuous and giddy times with heartfelt irreverence. Veering between lucid moments of desperate innovation and psychotic adventures on the rim of sanity, all the time riding roughshod at delirious speed over the potholes of “culture”, the reader is introduced to half-forgotten heroes, now fast disappearing into the fog of time, and the band of misfits who attempted to disrupt “the system”.